Self-Chord prototype available (free source)! Self-Chord is a P2P system that inherits the ability of Chord-like structured systems for the construction and maintenance of an overlay of peers, but features enhanced functionalities deriving from ant-inspired algorithms, such as autonomy behavior, self-organization and capacity to adapt to a changing environment. As opposed to the structured P2P systems deployed so far, resource indexing and placement is uncorrelated with network structure and topology, and resource keys are organized and managed by self-organizing mobile agents through simple local operations driven by probabilistic choices. A. Forestiero, C. Mastroianni, M. Meo, "Self-Chord: a Bio-Inspired Algorithm for Structured P2P Systems", CCGrid 2009 - IEEE International Symposium on Cluster Computing and the Grid, Shanghai, China, 18-21 May 2009. Best Paper Award. The GNU licensed Java prototype is available! 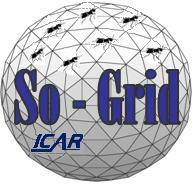 So-Grid is a set of P2P algorithms than can be adopted for the construction of a Grid information system. So-Grid assumes that Grid resources are pre-categorized in classes. To facilitate discovery operations, a number of ant-inspired mobile agents replicate the descriptors of the resources and accumulate the descriptors of different classes in different regions of the network. Grid users are allowed to issues discovery requests to retrieve a set of resources of a specified class, and successively can choose the most appropriate for their use. The discovery procedure is semi-informed: at the beginning, the search messages travel the network with a random walk strategy. As soon as one of them approaches a representative peer for the class of interest (i.e., a peer that stores a large number of descriptors of that class) the procedure becomes informed and the message is directed towards that peer. A. Forestiero, C. Mastroianni, G. Spezzano, "So-Grid: A Self-organizing Grid Featuring Bio-inspired Algorithms". ACM Transactions on Autonomous and Adaptive Systems, vol. 3, n. 2, May 2008. The paper is downloadble from here. You can also visit the So-Grid site to run your own simulations and analyze the behaviour of the So-Grid algorithms. Antares is a different P2P approach for the construction a Grid information system. Antares is devised for a Grid in which resources are indexed by bit keys, which are calculated with a hash function. Resources that share common characteristics (for example hosts having similar CPU power or memory capacity) are mapped to the same key value. Moreover, if a locality preserving hash function is adopted, similar resources are assigned similar key values. A. Forestiero, C. Mastroianni, G. Spezzano, "Antares: an Ant-Inspired P2P Information System for a Self-Structured Grid". BIONETICS 2007 - 2nd International Conference on Bio-Inspired Models of Network, Information, and Computing Systems, Budapest, Hungary, December 2007. You can also visit the Antares site to run your own simulations and analyze the behaviour of the Antares algorithms.